Project participants: Andrei Arkhipov, Alexey Vasiliev, Weld Queen (Alexander Ivlev), Dmitry Kolistratov, Ivan Korshunov, Marika Krasina and Anton Krivulya, Anastasia Kuznetsova-Ruf, Timofey Smirnov, Rostan Tavasiev, Zmogk (Konstantin Danilov). The project involves young artists, some constantly work with Fine Art, others participated in several gallery projects, and the first four authors on this list for the first time present their works in the Gallery space. The star is the oldest sign, symbol, object and has a lot of meanings, meanings and applications. Accordingly, the artists were completely free to choose the concept of their works and the plastic images of the embodiment of their ideas. As a result, this project brought together artists of different styles and trends. Andrei Arkhipov sees his star in baroque space. His dynamic compositions make up beautiful naked youths, the sensual corporeality of their images is saturated with naturalism, however, where beauty prevails, ethics rests. A riot of movement fills Alexey Vasilyev’s expressive canvas. Of course - dance, of course - rock and roll! Dmitry Kolistratov’s canvas “Not a life, but a fairy tale” transforms reality into the fairy-tale world of children’s perception, fills it with impossible, but wonderful inhabitants. His works from the “Souvenirs” series require efforts to make out, for example, Moscow State University or St. Basil’s Cathedral, whose contour image was veiled by the author in rich color. Each capital has its own "star" objects, the historical significance of which seems to be "washed out", and they themselves turn into souvenirs for tourists. Ivan Korshunov also sends us to the children’s country of fairy tales. 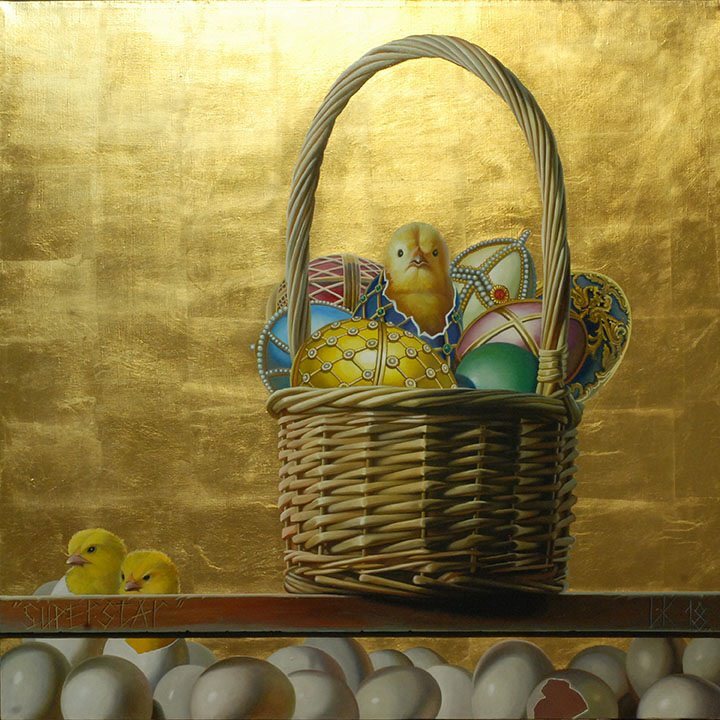 It seems that the artist started a Ryaba hen that lays Faberge eggs, from which the star kids hatch. Marika Krasina and Anton Krivulya are in constant movement in the space of the world, they have gone from denial to returning to culture, image and ritual. As a result, their work, which they buried for some time in the ground, and then extracted, turned out to be witnesses of history. The space of A. Kuznetsova-Ruf’s paintings is filled with air, modern Icarus floats in it in the light of day, the delta-glider pilot (“Bridge”), or this night air saturated with deep-blue color, in which it is so good to see the stars, comfortably sitting on roof of the house ("Banner"). Timofey Smirnov completely mischievously separated the stars familiar from childhood from the towers they crowned, and placed them in different landscape circumstances, and even made them talk! Dynamic abstract compositions of Rostand Tavasiyev are written in the technique of “behemothwriting” created by him, when instead of a brush the artist drops a plush toy into paint and already together with it creates a piece, leaving his co-author forever in it. As a result, a toy, such as a bunny or a bear, as the extension of the hand of the author symbolizes the creator’s eternal presence in the picture. Konstantin Zmogk is a street-art artist; he creates his abstract compositions on street objects and as chamber works. Color - form - movement - these are signs of his dynamic abstract canvases. And again Alexander Ivlev sends us to the fairy tale. So convenient to take a selfie in the womb of her sculpture Slonburger. The artist is free to proclaim himself a star, for, as Schopenhauer wrote, modesty is the only virtue of dullness, and titanium can safely say, I am a titan, I am a genius! Artists’ biographies together with them create galleries, some of the authors become famous. In this sense, the gallery can be viewed as a star incubator. Gallery - the territory of the stars!